What would a typical day at Centennial be like? Our typical day follows a schedule that allows the children to establish and develop their own natural rhythms. In keeping with the AMI Montessori philosophy, our morning program consists of a three hour work cycle. At the end of the work cycle, the younger children go outside to play before being picked up by their parents. Those who stay for lunch begin to set up and then eat lunch. After lunch they go outside for a period of free play followed by a roughly two hour work cycle in the afternoon. Following the work cycle, the children get ready to go home and play outside until the parents arrive. The work cycle is an uninterrupted time where children can choose their activities from what they have been presented, can join a small group activity, or may receive a presentation of new work. In addition to the Montessori materials, the Montessori work period includes any practical life activities such as cooking, gardening, working in the yard, sewing, etc. It also includes music and art activities and outside exploration (looking at the shape of leaves, finding insects, feeding the birds). All of these activities are considered Montessori work and the children are free within certain limits to choose their own activities. Small groups happen spontaneously and there is no formulaic timetable for these activities. An example of a day for one 4 year old may look like is described below, but it is important to note that the three hour cycle allows a child to establish his own routines and thus one child's work may look very different from another's. The purpose of the extended cycle is to encourage independence and allow time so that the child is not rushed in any given activity. Through this open time, the child gains the confidence and the ability to make good choices for oneself, but even this is a process. A child may at times need guidance from peers, the assistants or the directress to choose work or may participate more frequently in small groups until they feel more capable to choose work and transition from one piece of work to another. A day in the life of a Montessori child: The child enters, changes into inside shoes and hangs up his coat. As this child stays for the full day, he also places his lunch box on the shelf. This particular child has a morning routine that he has established and likes to follow. He goes to the bathroom and then washes his hands. Then he takes out the orange squeezing activity and almost always works on that first. After offering a glass or orange juice to his friend, he drinks his own glass and finishes the activity by cleaning up so that it is ready for the next person. Now he chooses a few more activities, which he completes easily. As he is working on washing the windows, he sees a group forming in the other room and decides to join. He dries the window and puts away his work, quietly joining the group activities. The group is not quite so interesting to him on this occasion and after a while he wanders away to get a snack and chat with a friend at the snack table. After snack, he walks slowly around the room and something catches his eye. He had been read a poem the day before and he sees the illustrated poem with a flower on it sitting on a shelf. Interested, he looks at the words and the illustration for a while and then goes to the opposite side of the room and removes a puzzle which illustrates the parts of a flower. This becomes his great work of the morning. For the rest of the morning, he works, head bent and focused to trace the flower pieces from the puzzle onto paper, color the parts and label them. Groups happen around him, children stop to respectfully watch his work, but he is fairly oblivious. A few times, he is not sure of a label and emerges from his work to ask the directress for help. She redirects him to an older child who can share his knowledge and they work together for a moment until he is able to carry on on his own. As he finishes, he looks up as if suddenly awakened, amazingly refreshed by his work, not tired at all. He puts his paper in his work folder and joins the whole group meeting which that day is being held to celebrate a friend's 6th birthday. Following the whole class meeting, the younger children go outside for free play and then get picked up while he readies his table for lunch. On this day, he chooses to sit with one other child and they enjoy their lunches together. Following lunch and clean-up, he and his friends go outside to play for a while before starting the afternoon work cycle. As his friends return to the class, he spots a worm in the flower bed and sits for a while watching the worm in the unplanted bed. This observation of nature is not free play, but rather is part of his afternoon work cycle. After a while as the last children have entered and changed their shoes, the directress calls him in and he goes to the book corner to look at books. Later he might practice reading, receive a lesson on geography or math, or play the bells. He is again free to choose his activities and thus he completes his day. Many parents are curious to know why, despite this rich environment, many of the children return home and cannot recount what it is they have done in a day! It is important to realize that for the very young child, it is difficult to both remember and recount their day. However, the inability to answer “what did you do today?” also illustrates the power of the absorbent mind. Although any one child may have a day as described below, the simplicity of the day belies the richness of what the child has absorbed from the environment. Though he/she may have been working on one piece of material, all around him/her children were working or quietly conversing, the directress was giving a lesson, a small group was happening in the corner, and outside the blossoms on the plum tree began to bloom. The child between birth and six does not process these events serially as we do. Rather, the entirety of their environment is captured by the absorbent mind- almost as a photograph. Thus the child working on one piece of work, though his conscious mind may be incredible focused on that work, is actually absorbing a wealth of experiences that we cannot even describe- and neither can the small child. * Montessori trained teachers are traditionally referred to as “directors” or “directresses” since “teacher” implies that the adult is bestowing knowledge on the child. In the Montessori environment, the trained adult is there to assist the child in the natural unfolding and development of his self. We therefore use the term “directress”. What can I expect my child to know after the three to six program? Children leave our program after what would traditionally be their Kindergarten year. They then enter first grade and they generally excel, occasionally skipping a year if they do not go on to a Montessori elementary. They are good readers and competent mathematicians, but more importantly, they love reading and seeing how numbers fit together in the different operations of arithmetic. Please see our academic philosophy for more information because our true goal is to help the child develop into a truly well-rounded person who loves this wonderful world we live in and is intensely inspired by numbers, music, art, language, science, and cultural learning. Beyond the academics there is a higher goal. It is not what they know that interests us, but who they grow to be. Our children are beautiful people, confident, kind and loving. They are strong in their beliefs and their opinions, but respectful and truly interested in other's opinions as well. They are passionate about their work and have developed the self-discipline to be a truly free individual capable of following that passion. Will my child become fluent in the second language? When considering Centennial, it is important to note that we are not a language school. In fact, while we are committed to Mandarin and Spanish as two of the major world languages, if we at some point were unable to find a teacher assistant open to the Montessori way who spoke those languages, we would never sacrifice the Montessori process by hiring an inappropriate assistant simply for the particular language. Language is included in our program based on Dr. Montessori and other noted experts' observations that children under 6 have an incredible powerful ability to absorb language from their environment. We therefore provide exposure to the second (or third) language through natural conversation with an adult with whom they have an emotional connection and to whom they are exposed each day. This is in keeping with the major body of research related to second language learning at a young age and in keeping with Dr. Montessori's own writings about the inclusion of a second language. In our program, language is absorbed in natural interactions. The amount that any one child absorbs is very individual and parents should not have the expectation that exposure to a language at school alone will make the child truly bilingual. The power of their minds is truly phenomenal and it does happen, but our true goal is to feed the child's hunger and love for words and language and to inspire in the child acceptance of and belonging to the diversity of the world. In essence, the exposure to the second language is not forced, but as with anything in the Montessori environment, it is a natural part of the children's world, there for them to discover and explore. Do you have circle time? We do not begin our day with a whole class “circle time” because the young child generally enters the classroom with something in mind to do. To require that all children sit for circle is an imposition by the adult on the child's natural energies and interests. Instead, children enter their classroom and pick individual work or occasionally join a small group which is already going on. These small groups of two to eight children (or occasionally more) happen spontaneously throughout the day. When there are a number of children wandering who cannot find work or there is something of interest to the children, one of the assistants or directress will invite two or three children who are not busy working into a group in a section of the class. Other children will naturally watch and may decide to put away their work to join. For instance, one day a child spotted a bird on a branch outside. This led to a small group being formed and an assistant took several children out to the garden to see if they could watch what was happening. They watched the bird build a nest and later that day, the directress led a group using a puzzle to name the parts of a bird. The activity for these small groups can be centered around a story, a craft, songs, cooking, gardening, grace and courtesy lessons, or any number of interesting discoveries. Towards the end of the morning session, we generally, though not every day, have a whole group meeting during which birthdays are celebrated, holiday presentations occur, songs are sung, stories told (both oral storytelling by children or adults, as well as from books), and the directress or children bring up any community issues which need to be discussed. This is also a wonderful time to share something that a child has found outside (a bug, special rock, interesting leaf) or brought from home (favorite music or a special cultural item). A child is always free to leave the group and keep working or to watch from a distance if they are not yet ready to participate. Sitting in a group is a developmental skill which comes at different points for each child and we respect the point that they are at. By the crowning year, the children do have the self control to sit for extended periods of time, to participate gracefully in the group conversation, and to model the respect of each other that is so important in a large group meeting. The children seem to work alone a lot. How do they develop social skills? Our children are beautifully confident and social individuals who develop true respect for others and wonderful relationships. Numerous research studies support our subjective observations and have consistently found Montessori children to outperform traditionally schooled peers on every measure of social, academic, and self-esteem attributes. However, we do it a bit differently than the popular culture currently suggests. Currently there is a great pressure on parents to “socialize” their young children. 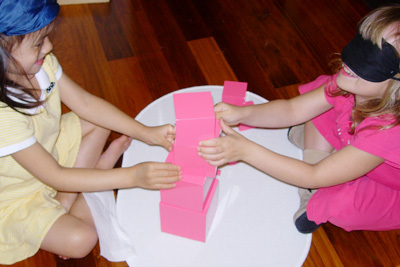 Both Montessori-based observations as well as most classical and current psychological research support the conclusion that children are not truly ready to begin meaningful social interaction and cooperative play or work before 4.5 or 5 years old. The interest in social interactions becomes very noticeable around 4.5 years old, but they are usually not particularly adept at true collaborative work. With ample exposure, this natural curiosity blossoms into true social grace and confidence by the start of first grade. Though there are other reasons as well, there is no coincidence that 4.5 years old is the age that we require children to stay full day (until 2:45). It is at this age that you will see children naturally interested in working together, doing group projects, and becoming intensely interested in social dynamics of the community. They begin their next steps away from the home as peers take on a new importance. In fact, in a Montessori Elementary, the vast majority of work is cooperative. However, a young child does not want to work with another child. He or she is often annoyed or frustrated if his individual work is interrupted. He/she may like to play in the yard with friends, briefly sit with a friend for snack, or watch another child working, but it is not his/her deepest desire. Rather, it is a momentary distraction (with the exception of watching work where it is the work being done that is satisfying a deep need in the child). This makes sense because it is this child's own process of self-formation that is critical to him. He must work on who he is- building a strong will and sense of self through repetition of work and developing the self-control to following his own interests before he can incorporate another's views and feelings into his work. If we push social interaction too soon, we encourage the development of an individual who defines himself based on his interactions with others rather than evaluating those interactions based on an already strong sense of self. If you think of an adult who is either socially competent or uneasy, it often has less to do with the amount of interactions he has had or the opportunity for social experience and much more to do with his/her own confidence. It is the same, but even more critical for the developing child. I've heard Montessori is very strict. Is this true? I've heard Montessori has too much freedom. Is this true? We answer these two questions together because they illustrate the two sides of “limited freedom” that we practice in the Montessori classroom. To understand this concept, it is important to understand the goal of the development of freedom. The young child is in the process of creating him/herself and it is their greatest desire to be independent and to be truly free. However, true freedom is often misinterpreted to mean a child who acts without restrictions imposed by an adult or by the community. To us, this is not only a misunderstanding of freedom, but leaves the child without the safe guidelines they need in order to understand the world. Rather, the truly free child is one who has no need for these external restrictions because he has a well developed internal sense of discipline which makes external restrictions superfluous. In essence, the truly free child is one who does what is accepted and right simply because he honestly feels it is the way to be. In this case the child does not need an adult to tell them how to behave because it would not occur to them to do anything else. As beautiful as the truly free child is, it is a process to get there. At first, the child needs fairly strict limits on their behavior. Within these limits, they are free- free to choose as long as it is appropriate work that they have had a lesson on, free to interact as long as they are not interrupting, free to move about the class as long as they are not running, etc. This is freedom within limits. As the child internalizes these limits and internalizes the abstract concepts behind them (i.e. we do not touch someone else's work without permission because we respect each person in the community and the work that they do, etc.) the external restrictions become quite unnecessary. Our children grow in their crowning year in the Children's House to capable, confident, and kind individuals who can be completely free to act according to their own internalized sense of what is appropriate, fair, or correct. Our specific guidelines are not necessary because the child has internalized the abstract principles behind them and simple acts according to their internal guide- a guide which is much more developed and far reaching than any of our limited guidelines. At this point, they are truly free. Because of the concept of limited freedom, freedom can be misunderstood even by Montessori schools. As there is no protection on the use of Montessori, there are schools which simply use the materials, but do not fully understand the philosophy. In these cases, the concept of freedom is often the first concept to be misunderstood and all children are either allowed the unlimited freedom that our older children may arrive at or they are all given the more strenuous rules that might suit a young child. These applications of freedom leave no room for the internalization of discipline and thus both will fail in helping the child to become truly free. In the one case, there are no guidelines to point the way for the child. Essentially, there is nothing to internalize and this leads to chaos. Contrary to the feelings of many adults, this is not liberating to a young child, it is frightening. They want to know what the guidelines are and they want the adults help in negotiating understanding these guidelines, but then they want to be free to act within those limits. This is safe freedom at a young age. Similarly, the imposition of strict rules which either do not allow any freedom within the guidelines or which are inappropriate once a child has internalized the abstract concepts does not allow the child to exercise his own judgment and thus paralyzes his ability to generalize these rules to other situations. He feels like he is trustworthy, yet we do not trust him. In that case, what is the point of developing self control if it is not a tool for the child to successfully navigate the world? In our classrooms, as with any aspect of the Montessori philosophy, freedom is an ever-changing and fluid concept. Though the guidelines remain the same for every child, the adult gradually fades into the background as a reminder of these guidelines as the child's own self-discipline develops. Again, this is then the point of true freedom for the child. There are a lot of academic materials. Will my child be pushed too hard academically? There is great concern about pushing a child too hard and it is important to understand that for us, a child's play is their work. The work in the environment is the work that over a hundred years has proven to be exactly what the child wants to spend his energies on. Please see our Educational Philosophy for a more detailed explanation. Do you believe in make-believe or free play? We do believe in both. It is through undirected time that the child develops their creativity, lets off excess energy, experiments with social customs and individual relationships. Free play is an extremely important part of a child's day. In fact, it is our greatest desire that when the child goes home at the end of the day, he is free to create projects for him/herself, play in the yard or park, bike, skip and run, and enjoy his world in as natural a way as possible. We do not recommend that the child at this age participate in classes after school or too many structured playgroups because we sincerely believe that school is enough to plant the seeds of the world. Most important at this age is that the child needs unstructured (that does not mean without guidelines to protect him or others he plays with) time to explore and to create. Left to their own devices, the child will often engage in some degree of fantasy play, but this play is very different than what parents often imagine. Most parents love the idea of make-believe because they remember their fantasy games from childhood (princesses, dragons, and grand adventures) and it is a beautifully romantic memory. However, most of an adult's memories are actually from the elementary years or perhaps very late primary (3-6 yrs) years. The type of fantasy play that we remember is very appropriate for the elementary child who understands reality and now becomes intensely interested in the difference between reality and fantasy. Myths, legends, simple science fiction and fantasy worlds take on a wonderfully powerful role in the elementary child's quest to understand his complex world. The child in the first plane of development, however, is not particularly interested in fantasy (unless they have had a strong influence from an older sibling or popular media). This child wants to understand what is real and wants to work on real things. Most often, if given a choice between real activities and fantasy play, the child will choose the real activity. How often does your child hang about your legs as you cook dinner? That little child may be surrounded by all the toys in the world and many of them visually begging the child into a fantasy world of play, but the child remains at your legs. “Let me see! Let me do! Let me help!” He/she wants real work and in our classroom, we are thrilled to fill that deep desire. We do not have a pretend kitchen for them to play in because we have a real kitchen where they cut, chop, stir, bake, and pour real food. They wash their plates in soapy water and set their tables for snack- and they do so with great joy. We do not have a dress-up corner because our children take their own shoes on and off, change clothes when something is wet or dirty, and help other children with any fastenings on aprons or clothes that they cannot manage. If they have the desire to work on a fastening, they do so with the dressing frames which isolate the actual fastening they are interested in mastering. For the most part, the dress-up corner is not attractive to the 3 year old because it is make-believe (children have no need of costumes to role play- their minds are more than powerful to make up for the lack of a costume), but because it is fun to work out how to put everything on. How often do you find the child dressed up only to change clothes two seconds after? They are interested in the process- not the end result. That is not to say at all that the child under six has no desire to play make-believe. They do and we do honor that desire in the child just as we honor all of the special aspects of this plane of development. Both our morning and full day program have periods set aside for unstructured outdoor play and during this time the older children do engage in make-believe, but it is not fantasy-based make-believe. Most of the natural play they do is to change real things into other real things in order to better understand the world they live in. A rock outside becomes a bun and the hollow of the tree is an oven. One little girl becomes the mommy in a game and the other two the children. That “mommy” has the opportunity to experiment with imposing different rules, with giving comfort to a hurt “child”, with guiding other children. The “children” have the opportunity to replay a conflict they've had or have witnessed- to figure out how to work it out without threatening anyone's true feelings. If you actually watch these interactions in a natural setting without the influence of popular culture or characters, the children are very interested in make-believe, but at this age it is very much reality-based make-believe. That said, our periods are limited because we believe that most of this unstructured free play is best done at home where your own guidelines can be enforced, where the family values are sorted out by the child, and where they have an extensive expanse of time to get immersed in their activities- whether tasks of daily living or make-believe. Also, the child is just becoming competent in social situations and it is unfair to expect the child to navigate a long period of free play with many other children without overtaxing their developing self control. Why don't you offer an extended day care or nap time for the younger children? Over almost 20 years of teaching experience, we have found that it is extremely difficult for a child under 6 to cope with an extended day program. We realize that it is very controversial to be so direct about after-care programs, but we do have seen consistent behavioral issues in children who stay until evening at school. We would not be doing our work in service to the child if we were not honest about that. While our school is as home-like as we can make it and the children and directresses form a tight and loving community, it is not the same as home and a child of this age still needs the one on one (or one on two, three or four with siblings) that home life in the afternoon and evenings provide. The home provides a beautiful counterbalance to school. Everything is child-sized, child directed, and child-centered. Although this is important for the developing child so that he/she is not continually frustrated in his attempts to be independent, it is equally important that the child learn to live in a family community where everyone sacrifices and compromises so that each person's needs are met. When the home can be consistent with the aim of supporting the child's independence, the individual nurturing that takes place on such an intimate level is simply critical for the child to develop into a strong and confident individual. We do understand the financial realities of working parents and we do know that a nanny in the home is not always possible. Though being at home with mom or dad is wonderful, it is not a reality for everyone. We strongly encourage parents to use our yahoo group parent list or our student contact list to meet each other and perhaps work out a nanny-share arrangement or some other situation where the child can at least have a smaller caregiver-child ratio and be in a real home. Why is your Children's House program five days a week? Montessori educators over 100 years have found that the consistency of the five day program is critical to the development of the child. Children at this age love order and routine. They gain great confidence from knowing what they are going to do that day and how it is to be done. By having a five day program, the guidelines, schedule and expectations are consistent for the child, the community of children is stable, and the flow of the week is peaceful. That said, we do offer the four day program for toddlers in recognition of the importance of home life at this age and recognizing that this is often the only chance for one-on-one time with parents without other siblings which is a wonderful opportunity for the child. It is, however, a compromise which does slightly affect the consistency for the child. At this young age, we feel it is on balance worth it for parents who can spend that time. What is your recommendation for my toddler? We strongly believe that the child between three and six benefits incredibly from the Montessori program and truly needs to be in an environment which can cater to his needs and provide materials that will capture his energies. The three to six year old has spent the last three years trying to understand his/her home and those closest to him/her and it is developmentally appropriate for the child to step out and begin the exploration of a wider world. The toddler between two and three is in a different stage. Some children at this age are also showing a strong developmental need to be out in the world. The toddler program is a wonderful place for these children to begin their first steps out of the home in a nurturing setting with a high teacher student ratio and a small social group. For the most part though, the child between two and three is really still content with the smaller world of home and daily life. There is intense societal pressure to “socialize” the child, but really this should not be your aim in starting the toddler program. 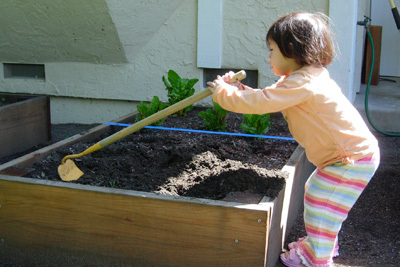 Most toddlers would do quite well at home if parents are willing to truly include them in the real activities they crave to experience: cutting bananas, unloading the dishwasher, digging in the garden, exploring music, taking long walks, feeling different textures, etc. For these children, if the parent can be truly there and truly engaged in these very simple activities, the child of this age would honestly be best occupied at home. He does not need to be taken to class after class to be “socialized”, but simply allowed to truly participate in real life. This is difficult and unrealistic for many families due to siblings, work, or preparation of materials. For these children, the toddler program is a great start, but we still encourage you to try as much as possible to also resist pressures to put them in additional classes and simply try to “help them to do it for themselves” at home. We promise that this leads to the true foundation of a competent social child, and further, to a child who is a grounded and confident individual in every aspect of life.